As part of the climate emergency we need to acknowledge the issue of the need to reign in aviation emissions. We have Melbourne Airport and Essendon Airport just to the north of Moreland and we note plans to expand and grow the airport as part of the Preliminary Draft Masterplan 2018. A third runway is being planned. Expansion of airport infrastructure, no matter how green it may be, does not alter the increase in flights and projected passenger kilometres, and the increase in aviation emissions and aviation climate impacts this will engender. Continued growth in aviation is unsustainable and unsupportable in any climate emergency framework. Major new airport infrastructure that facilitates growth in aviation should not be countenanced in any way. We acknowledge the role of aviation has played in development and economic activity and the necessity for just transition for this sector. We support Hume Residents Air Action campaign (website | Facebook) in their opposition to development of the airport and a third runway for both direct reasons of particulate pollution, noise pollution, and congestion this will cause, and the massive indirect impacts of growth in aviation emissions and climate impact. For this reason Climate Action Moreland decided to join the global Stay Grounded Network at our September 2018 meeting and we fully endorse the position paper: 13 steps for a just transport system and for rapidly reducing aviation. The aviation sector is the world’s fastest growing greenhouse gas emitter and one of the most polluting sectors. By 2050, carbon emissions will quadruple, according to a 2009 ICAO information paper. Hundreds of airports are being built or extended. While only 7 % of global population ever sat in an airplane, others are bearing the costs: Native communities loosing their livelihood and the biodiversity, locals affected from noise and health problems, and people in the Global South already suffering from climate change. The Intergovernmental Panel on Climate Change (IPCC) has estimated that the total radiative forcing associated with anthropogenic agents in 2005 was 1.6 W/m 2 (0.6 – 2.4 W/m 2 ). This suggests aviation’s contribution excluding cirrus cloud effects is in the order of three per cent. When cirrus cloud effects are included, aviation’s contribution could be as high as 6 – 8 per cent. 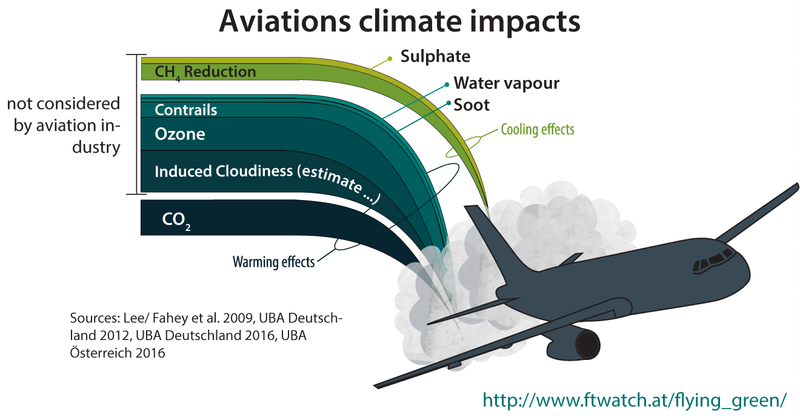 Hence, while aviation is not currently one of the main drivers of global warming, its effects are significant and should not be overlooked in policy processes. But it is not only greenhouse gas emissions, primarily Carbon Dioxide we need to be concerned about. These emissions occurr high in the atmosphere and the total climate impact of aviation is estimated at approximately double or triple the CO2 emissions. 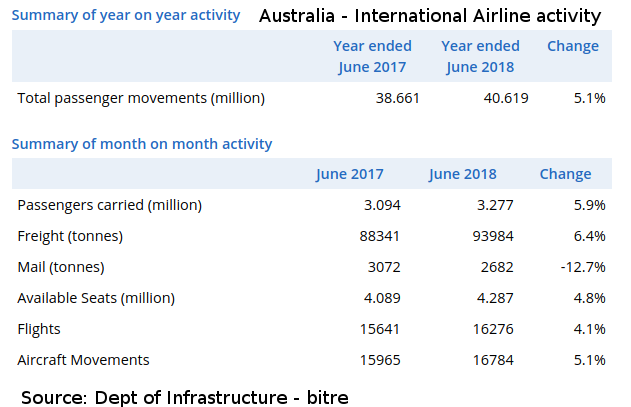 For Australia, International scheduled passenger traffic in June 2018 was 3.277 million compared to 3.094 million in June 2017 – an increase of 5.9 per cent. 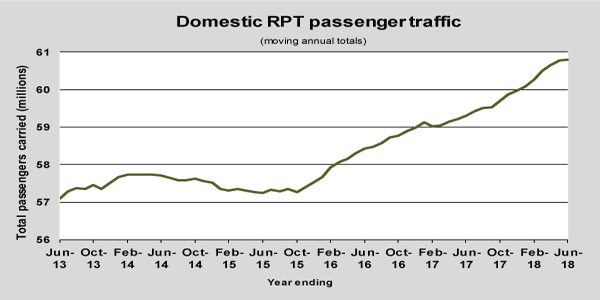 With domestic aviation, 4.72 million passengers were carried on RPT flights in June 2018, an increase of 0.5 per cent on June 2017. New airline airport expansion, no matter how well the facilities are carbon mitigated and energy efficient, still do nothing to mitigate aviation climate impact. It is the exponential growth in aviation, with only limited efficiencies to be gained, that is the real problem here. Australia’s total fuel use and CO 2 emissions are rising due to increasing traffic across the industry. Fuel use has increased from 7,546 megalitres (ML) in 2012 to 8,772 ML in 2016, while emissions have risen from 18.94 Million tonnes (Mt) of CO 2 -e in 2012 to 22.02 Mt in 2016. The report also notes the difference between domestic aviation and international aviation. Short haul flights are notably more fuel intensive. Ground transport alternatives such as high speed rail if it was built would provide an important alternative. 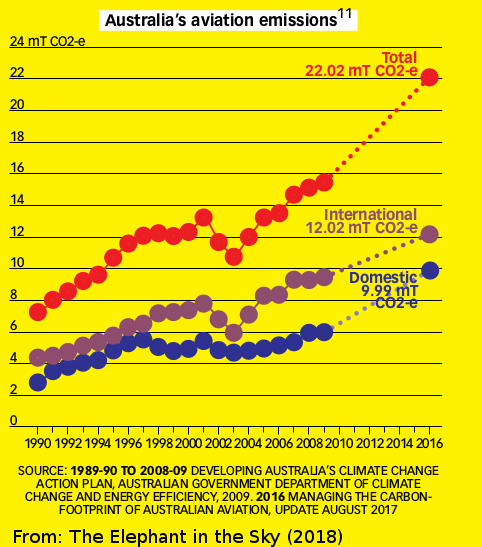 The results show that Australia’s international aviation activity is significantly more efficient in fuel use and CO 2 emissions than its domestic counterpart. This is likely attributable to the difference in fleet age between international and domestic aviation and the impact of the fuel-intensive stages of every flight being the take off and climb phase. In line with global predictions on growth in aviation traffic, Australia’s aviation activity is expected to continue to grow. Existing airports are undertaking capacity improvements projects including the building of new runways, and major new developments such as the Western Sydney Airport are likely to increase overall traffic and thus RTK for Australia. This will increase total fuel use, which, despite increasing efficiencies across a range of measures, will result in an increase in CO 2 emissions. It is useful to consider what typical growth rates are ‘allowable’ within the constraints of a 2C target. 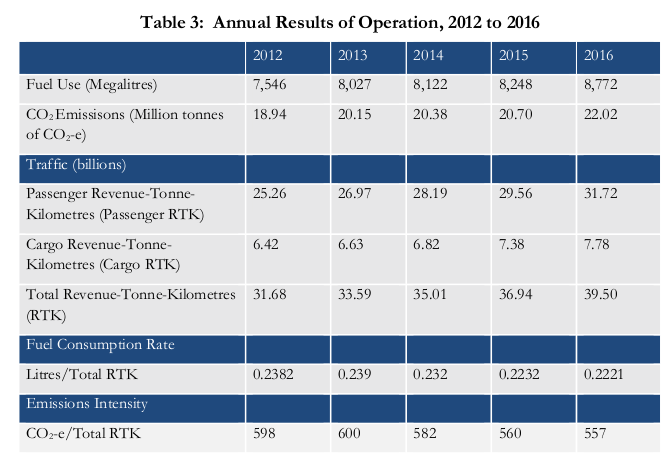 Assuming an optimistic 2% annual fuel efficiency improvement, for the C + 4 scenario (Figure 1), passenger-km growth rates would need to be cut to zero from 2020, with a 4% p.a. reduction from 2025. C + 5 requires zero growth to 2025, then reductions of 6% p.a. from 2033. Constraining demand for flying is unpopular, with little reference to it as a viable policy option in industry and government literature. Nevertheless, it can be argued that a gradual reduction from the typical 3% p.a. growth seen since 1990, to zero by 2020 to 2025, is no more challenging to achieve than a large-scale and rapid fleet-wide role-out of new technologies, or emissions trading implemented globally and commensurate with 2 8C. A personal carbon quota scheme for CO 2 that includes international flights is one mechanism that could lead to such a radical change in levels of per capita flying (Fawcett, 2010). Administratively, this type of policy could build upon existing credit-card-type technology (Starkey & Anderson, 2005). It is difficult to imagine how a policy could physically drive a rapid technological overhaul of the global aircraft fleet in a similar timeframe. It is highly desirable therefore that there is more research analysing where absolute cuts in passenger-km through the provision of alternatives such as virtual communications or long-distance, low-carbon rail travel, to add to existing literature (e.g. Coroama, Hilty, & Birtel, 2012; Guldbrandsson & Malmodin, 2010). In aviation, the limit to technical and operational change has led the industry towards a preference to use a global emissions trading scheme to provide net emission cuts. In other words, the sector expects CO 2 savings will generally be made in other sectors of the economy to enable aviation-related CO 2 to grow or be cut by less. Yet, even with trading, a target of a 50% net CO 2 cut is not sufficient to meet the 2C goal. Ironically, by comparing aviation with shipping, it becomes clear that if there were mitigation options available to the air transport sector, its relatively simple institutional set-up, with its small number of manufacturers, fewer markets and actors, as well as a lower number of major national players, would make incentivizing change practical. Instead, with emissions trading disconnected from the 2C challenge, demand-management and biofuels offer the only feasible ways of cutting CO 2 in the timescale compatible with the available CO 2 budget. Yet, both raise interesting ethical and moral issues. Should aviation, which in a global context continues to be dominated by relatively affluent leisure passengers (Williams, 2007), take priority over other sectors for the use of sustainable biofuels in preference to less popular policies aiming to curb or even cut growth rates? The private Melbourne Airport corporation forecasts expansion of aviation and continued growth of this business. The population of Melbourne is growing rapidly and, with it, demand for air travel is also growing. The 2023 airport development concept includes the Runway Development Program (RDP), which will involve a third runway and extensions to the existing east–west runway. The 2038 concept includes the expansion of the terminal buildings and new extended piers. These expansions are intended to meet a significant increase in demand for air travel. By 2038 Melbourne Airport is expected to cater for more than 65 million passengers per year (up from 34 million in FY16). 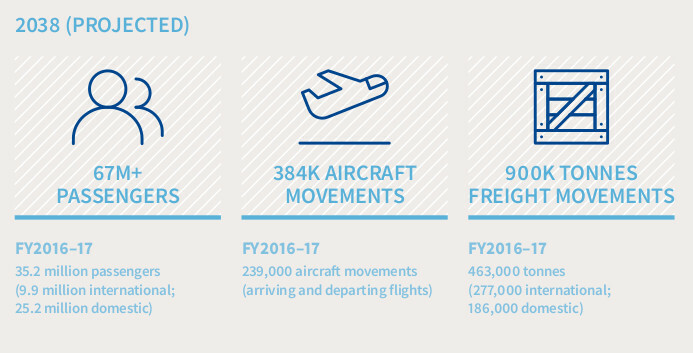 Over this same period, aircraft movements are expected to increase from 238,000 to 384,000 movements per year and freight throughput is expected to almost double. The airport is taking action within it’s own Environment Strategy to reduce it’s carbon footprint, by “investing in renewable energy, energy efficiency, water efficiency, improved waste management and sustainable procurement”, but none of this compensates for the growth in aviation, aviation emissions and aviation climate impact. This is in effect greenwashing the impact of aviation. Under section 5.6.2.4 on Climate change risk reduction to extreme weather events is factored in as part of the Masterplan. Transitional risks associated with the regulatory environment are also included in a vague way. Transition risks and opportunities are not directly linked to climate-related events but relate to the regulatory and market transformation likely to result from governments and communities acting to curtail greenhouse gas emissions and/or adapt to climate change. These risks have been examined and have the potential to affect access to capital, reputation, investor concerns and regulatory pressure on the carbon-intensive aviation sector. The airport’s current enterprise risk management system includes transition risks related to state and federal carbon policies and energy market volatility. Conversely, some of these factors also represent opportunities to drive projects in renewable energy and resource efficiency. Melbourne airport is relying on it’s economic contribution to Victoria as future proofing it’s business and so fails to advocate for regulatory resolutions to aviation emissions that would impact the growth of it’s business. Aviation use for travel and freight has become highly normalised. Because we are locked into economic growth and private corporations in aviation and the airlines sector driving future growth, with the full participation of state and Federal Government, reducing aviation emissions becomes a highly wicked problem. For domestic travel in the Melbourne-Sydney-Brisbane corridor High Speed Rail makes enormous sense, and could be built within a ten year period and be operational by 2030. If the full environmental costs of aviation were included in ticket prices, the fares for high speed rail would win hands down. But High Speed Rail for this corridor is competitive even without factoring in the full climate impact of east coast flight routes. Travel times between Melbourne and Sydney and Sydney to Brisbane could be around three hours. Fares could be priced similar to current air fares. Rail could be powered by renewables for close to zero emissions. The capital cost of about $84 billion could be fully recovered from operating profits within about 40 years of operation. Oppose the Melbourne airport expansion as it will directly increase Australian contribution to aviation emissions. Support fast rail proposals for regional and interstate travel. If you do fly to a conference or visit family overseas, use economy class and make it a multipurpose trip perhaps incorporating a holiday as well to limit the number of flights you might do. Visit the Stay Grounded website at https://stay-grounded.org/ and read the 13 Steps for a Just Transport System and for Rapidly Reducing Aviation (local Climate Action Moreland version), and if you are an organisation, sign on to this statement. Read the report “The Illusion of Green Flying” (2017), (PDF) written for people and groups that want to understand the greening strategies in order to effectively address aviation growth and climate change. Therefore, the report also describes different answers from civil society actors and needed strategies to set a limit to aviation growth.